This is true in every aspect of our lives. From the basic cells in our body that continually try to find homeostasis to the broader concept of finding equilibrium in our everyday lives, we are a species that is always seeking balance. It's why we feng shui our homes and meditate --it's an attempt to seek a sense of grounding and stability in an otherwise chaotic world. But did you know that we are very influenced by smell? We usually aren't cognizant of this, but smell can affect our mood, how we sleep, how we concentrate, and our level of happiness. By utilizing our diffuser oil air freshener and candle, you can find calm and relief from stress in a society that expects a lot from us. At Calm Earth, we encourage you to take time out of your busy schedule and relax, center yourself, and appreciate all of the senses you take for granted and the simple things life has to offer. Your contentment is paramount to us, so if you aren't happy with your purchase, please return for a 100% money back guarantee. 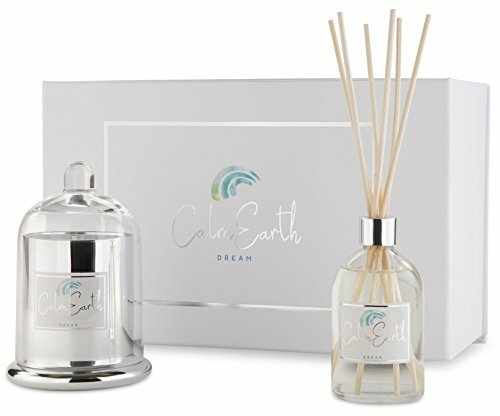 A UNIQUE GIFT: The Calm Earth candle gift set is the best sister gift, grandma or thinking of you gift.The candle set comes in a luxury box with a glass dome cover. This diffuser oil set is great for mom on Mother's day, a Christmas gift, a housewarming party, it has the best smelling candle and glass candle holder. Give it as a Valentine's gift, happy birthday gifts, wedding gifts, new parents gifts or a miss you candle gift. The best gay gifts for women and men. AN INCREDIBLE SCENT-SATION: When you take the pure soy wax scented candle and reed diffuser oil out of the box, you will immediately catch a waft of the luxurious aromas that comprise the Calm Earth Dream set. From the top being a blend of mandarin, mimosa and coconut, then progressing into soft cashmere and winter dahlia, and finishing with vanilla and creamy sandalwood. Please enjoy our best smelling candle in a quiet space, with time to just be. ENCOURAGE A CALMING BALANCE: This long-lasting, reed diffuser and luxury boxed candle set will calm and de-stress any home. Whether you place the aromatherapy candle and diffuser oil set in the bathroom or master bedroom even a guest room it will be sure to provide an elegant impression for anyone who sees it. The Dream candle gift set is best for quiet time, meditation to calm the mind, entertaining, and escaping daily routines for a few minutes to stress relief your body. FINDING YOUR INNER PEACE: Calm Earth believes that finding balance and peace in one's life is essential to a happy existence. We believe in the power of magic, love, and scent, and our stress relieving candles were designed around these principles. Everything we see, touch, smell, taste, and hear affects us. These delicious fragrance candle and reed diffusers oil sets will awaken the senses, helping centre your vortex so you can give back to the universe all the good energy you are taking in. CANDLE MEDITATION: Calm Earth encourages quiet time with candle meditation. This natural process with candles and oils are assisting you into a stress free mindset to feel relaxed using candle light and smelling beautiful soft scents, reducing daily stress. The Dream candle and reed diffuser set is made of only the highest quality products derived from 100% pure soy wax with a natural cotton wick, the oil reed diffuser sticks are natural wood and the oil in diffuser a soft aroma. If you have any questions about this product by Calm Earth Co, contact us by completing and submitting the form below. If you are looking for a specif part number, please include it with your message.